This is an unusual entry for a trail, but oh is it fun ... ... and so different from the rest of the riding in Mongolia. The backcountry of Mongolia is a mountain biking paradise in pristine landscapes. You can drive 10 minutes out the capital or for days and find biking all along the way. However, you don't even have to leave the capital to find some fun. 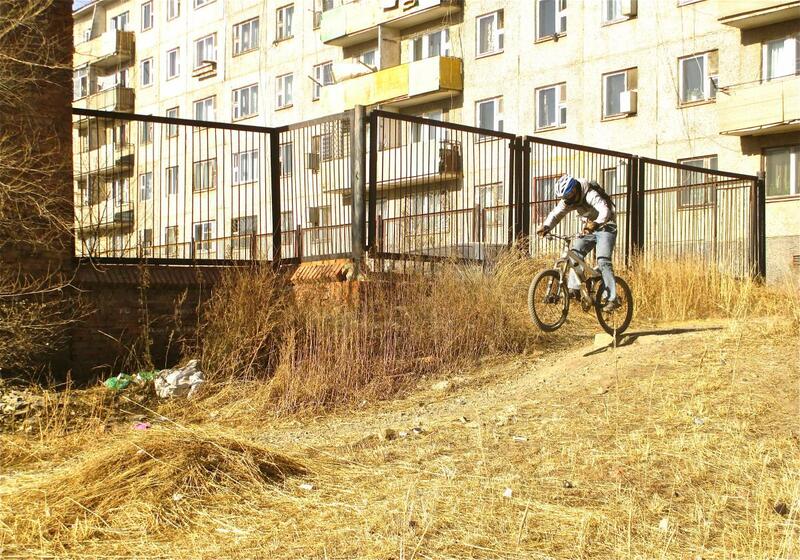 Our family lives in District 15 of "UB" (Ulaanbaatar), and the district itself is a blast to ride. It sits on a hill and has dirt track, banks, drops, short chutes and obstacles everywhere. It's hard to visualize unless you have been here. The conditions are pretty much inner city, but with less cement and lots of dirt. =) Check out the photos to get a feel for the fun to be had. It's kind of cool too to realize that District 15 is only 2 miles from the Mongolian Parliament. As you will see, there are advantages to living in a lesser developed nation as a mtber. Basically, District 15 is one of my main "after work" rides -- just roll my bike out the door and let the fun begin -- unless of course it is winter in Mongolia. Then one must sit and wait for the thermometer to find its long way back to near freezing temps again to get on the bike. Review: Almost completely dried out from snow/ice melt with only some wet/muddy places on the north side of buildings. Review: First ride of the year for me TODAY!!!! It was AMAZING. BEAUTIFUL day. Sunny and 34F. I wanted to start riding before this, but my rear shock was busted and getting repaired. Rode for about 2 hours in District 15 and the front end of Altan Olgii. I found an awesome 1 mile (1.5km) 300' DH run from the first top of Altan Olgii back to the main road (North Road in Sansar). It mostly follows a drainage through the ger district. Rippin' speed, banked turns, little jumps, lots of rocks, but not overly rough. It was a quite the discovery and just a couple of miles from my front door. This will be an after work "go to" for me this year. Way too much fun. Life just got a little faster in the right way. Review: We had a relatively warm first three weeks of February. Though the trails in the mountains are still snow covered, the ice and most the snow are gone in Ulaanbaatar. That means It's time to start breaking in the body for another year of riding. And District 15 is the place to do it. Review: Just so much fun to be found here with so many obstacles to play on. Though I rate the "trail" intermediate in difficulty, there are many advanced and expert obstacles to play on. Many are FAR beyond my feeble skills. Though I have limited the description of District 15 to just 4 miles of track, if one pedals north through the district into the Altan Olgii area for just a mile and half (through the ger district above the North Road uphill about 1.5 mile), you will find yourself at the top of the hill (about a 400' climb). From here you can ride for miles in open land on big slopes mostly 400 to 600 feet high. The 15th really has so much to offer, within it and immediately connected to it. District 15 Network MTB Trail 4.00 out of 5 based on 4 ratings. 4 user reviews.